JEFFERSON, WI (Saturday, July 16, 2011) Ty James of Oconomowoc rocketed out into the lead of the Bill Collins Memorial 50 lap Late Model feature presented by Tired Iron Promotions on his way to leading every lap and getting the victory. The win marked the tenth different feature winner in as many weeks of competition at Wisconsin’s Action Track. James and Rob Myers led the field of 18 drivers to the green with James taking control of the point through turns one and two on the opening circuit. Myers fell in line behind James with Shaun Scheel riding in third. James started to move away from the pack as Scheel moved into the high lane next to Myers. Scheel grabbed second just before the first of four caution periods slowed the field. Point leader, Jason Erickson, pulled his mount to the infield under the caution ending his night. As racing resumed, Scheel began to apply pressure to James out front while Brandon Pendleton worked past Myers for third. The top two began to break away from the pack as Pendleton tried to hold off Dylan Schuyler for the third position. Schuyler claimed the spot as the second caution waved on lap 14. Scheel continued to pressure the leader through two more cautions as the laps ticked away. Lap after lap, Scheel got a run to the inside of James entering turn one, but James pulled back ahead down the back stretch each time. James held off the advances of Scheel to see the checkers first and pick up the win. Scheel came home second with Schuyler, Steve Dobbratz and Trent Erdman rounding out the top five. 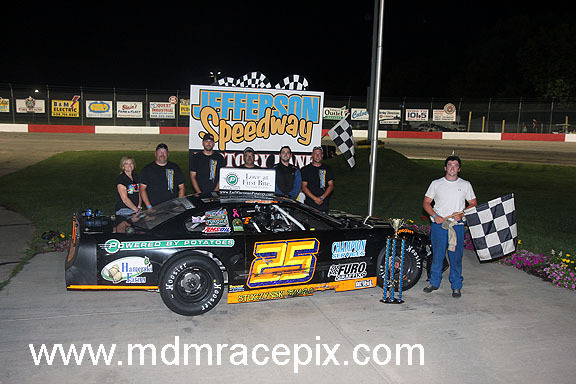 Sportsman point leader, Jason Thoma of Jefferson, claimed his first feature win of the 2011 campaign by winning the 30 lap main event. Ken Hoff and Will Rece battled side by side on the front row as the racing got underway. Rece grabbed control on lap two with Curt Thompson in tow for second. Thompson quickly worked around Rece for the lead as Thoma moved into third. Thoma followed Thompson into second on lap five as he set his sights on the new leader. Thoma made his move on lap 12 as he got a run on the low side, drawing even with Thompson on lap 13. Thoma continued to inch forward each lap until gaining sole possession of the lead on lap 17. Thoma immediately began to stretch his advantage upon claiming the top spot. Jay Kalbus made a late charge into second on lap 24, but Thoma was already checking out from the field. Thoma cruised to the stripe to get the win followed by Kalbus, Thompson, Kurt Kleven and Brady Lilly. Mike Lambert of Madison motored to the front of the field and ran off to win the 20 lap International feature event. Tytus Helgestad led lap one with Neil Higgins up to second. Kenny Au charged under Higgins and continued forward under Helgestad. Au claimed the lead on lap four with Gary Stark in tow for second. Stark drove under Au a lap later trying to claim the top spot. On lap five, Stark drifted high in turn four allowing Lambert to shoot past into the lead. Stark followed into second as the leaders lined up single file. Lambert drove to the checkers unchallenged for the remainder of the event to get the win. Stark was second followed by Mark English, Au and Kyle Smith. Hobby Stock point leader, Jim Tate Jr of Deforest, extended his lead in the standings by winning the 25 lap feature event for his division. Rodger Stephenson led early on with Chester Williams running a close second. Williams drew even with the Stephenson on lap two, clearing for the position a lap later. Kyle Chwala followed into second, bringing Steven Sauer and Tate along with him. Sauer and Tate got around Chwala on lap eight with Williams still showing the way. Tate slipped under Sauer a lap later, sliding up in front of him to claim second. Tate stayed in the outside groove as he closed in on Williams. Tate drew even at the midway point of the race, continuing to inch forward lap after lap. Tate finally cleared for the lead with seven laps remaining as he drove off to get the win. Williams settled for second with Sauer, Tony Ciano and Chwala completing the top five. Deerfield’s Scott Pauls claimed his second straight feature in the Road Warrior division after winning the 15 lap event. Jimmie Pankow and Rory Hardy led the field to green with Pankow taking control entering turn one. Bill Reynolds moved into second with Rodger Stephenson in tow for third on lap two. Pankow started to open up a big lead while Reynolds and Stephenson battled for second. Stephenson finally claimed the spot on lap eight with Pauls in his tracks for third. Pauls quickly moved under Stephenson to claim second on lap nine as he started to run down Pankow. Pauls caught the initial leader with only three laps to go as he moved to the low side. Pauls pulled alongside Pankow entering turn one on lap 13 and clearing for the lead as they exited turn four to see the white flag. Pauls drove off to get the win with Pankow coming home second. Rob Lange, Stephenson and Reynolds rounded out the top five. Heather Stark of Waterloo completed the clean sweep for the evening by laying claim to the feature as well as garnishing fast time and winning her heat race. Brandon Johnson led lap one from the pole. Dave Schmidt and Josh Lenz swapped the second and third spot several time behind Johnson while Stark sliced her way through the field. Using the outside, Stark motored up alongside Schmidt for third and continued to move forward. Stark claimed second from Lenz on lap 15 and found herself outside of Johnson a lap later. Stark cleared for the top spot on lap 17 with Seth Reamer following in her tracks for second. Stark cruised to the checkers to the get the win followed by Reamer, Johnson, Lenz and Schmidt. Next Saturday, July 23, is a full program of racing in all six divisions as well as a demolition derby following the racing action. Time trials begin at 5pm with racing at 7pm sharp. Jefferson Speedway is located halfway between Jefferson and Cambridge on Hwy 18. Please visit www.jeffersonspeedway.com for more information.